The Blues welcome Premier League new boys Norwich to Stamford Bridge on Saturday keen to improve on their lacklustre start to the season. Their cause will be boosted by the signing of exciting 23-year-old Spanish winger Juan Mata, who arrived from Valencia in a £26m deal and should make his debut on Saturday. Fellow new boy Oriol Romeu is in contention to start, but the game comes slightly too soon for David Luiz (thigh), while Petr Cech and Michael Essien (both knee) remain sidelined and Daniel Sturridge serves the final instalment of his three-match ban. Portuguese shot stopper Henrique Hilario will keep his place in the starting eleven. For the Canaries, the season has begun with two successive 1-1 draws – against Wigan at DW Stadium on the opening day, and then again against Stoke a week later at Carrow Road. Paul Lambert will be without long-term knee injury victims Daniel Ayala, Elliott Ward and James Vaughan for the daunting trip to London. Striker Steve Morison was in some doubt for the MK Dons clash with a groin strain, but after managing 30 minutes he should be in the frame for a start at Stamford Bridge. Chelsea have won the last four games against Norwich in all competitions, scoring at least three goals in each game. Chelsea have won seven and lost none of their last eight Premier League games at Stamford Bridge. The Blues have fired in more crosses than any other side in the Premier League this season (54). Chelsea have scored an average of 1.9 goals a game in the month of August; better than any current Premier League side. Norwich City have lost only one of their last nine away games in league competition. 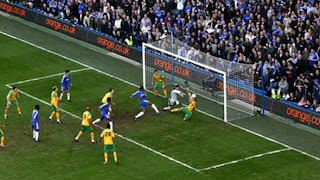 The Canaries have failed to score in five of the last seven matches against the Blues. Canaries’ striker Grant Holt is the most fouled player in the Premier League so far this season; suffering 11 illegal challenges. Norwich City have already used 19 players in the Premier League this season; no other side has used more. Paul Lambert’s side have faced 38 shots in their first two games of the season in the Premier League; only Swansea (40) have faced more.